SAGINAW GEARS dot com: There's no cheerleaders in hockey! There's no cheerleaders in hockey! It did not take a season for the Gears to gain a rabid fan base, it took about a month and a half. The Gears booster club formed shortly after the first season began and by December there were some 500 booster club members. Such a rapid explosion in popularity for the team led to some little anomalies. 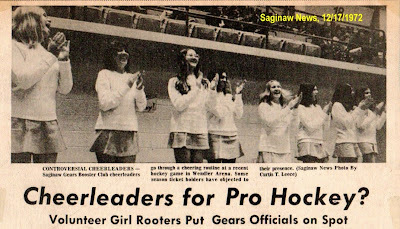 One such oddity was the Saginaw Gears cheerleaders. Pro hockey, and all levels, had a very standard formula for how a game event should take place. 1) The players arrive, 2) the fans trickle into the arena, 3) the teams come out and skate a warm-up while the organist plays some delightful music to skate by... of course, never "Lady of Spain." 4) the Zamboni resurfaces the ice. 5) officials come out. 6) both teams come out. 7) National Anthem. 8) first period- skating, shooting, checking, fans booing, fans cheering, perhaps a penalty or two. 9) between periods- fans mill around, Zamboni resurfaces. 11) second period- skating, shooting, checking, fans booing, fans cheering, perhaps some blood and some stitches- either in the crowd or on the ice- both being equally likely. 12) between periods- fans mill around, Zamboni resurfaces. 13) third period- skating, shooting, checking, fans booing, fans cheering, several fights. 14) the end- someone wins and someone loses, fans go home awaiting the next game... PERIOD. That has always been the way it was done- pure hockey. There were no cheerleaders in hockey- there never had been any cheerleaders in hockey. Just like there's no crying in baseball, there's no cheerleaders in hockey... but someone forgot to tell the Gears booster club that. Cheerleaders first appeared in the second week of December 1972. Dressed in bluejeans and orange sweaters they took up a position at ice level below section 10. In a line the young girls- all of whom were high school age- stood and did some clapping, jumping and cheering. At first, most fans and players simply gave a "what's up with that?" sort of notice. At the next game, however, the girls appeared dressed in classic cheerleader outfits and wearing Gears colors. This time they were moving around and cheering at assorted locations- mostly at ice level. It appeared now that the Gears had some sort of official cheer leading squad. Of course it was not the case- these young ladies were simply enthusiastic members of the booster club who thought this was a fun idea. Most long-time hockey fans and especially the Canadian hockey purists, thought otherwise. Season ticket holders immediately began to complain loudly about the cheerleaders, players were getting crap from the opposing players about the cheerleaders and to the Gears front office, and most importantly, to Wren Blair, having cheerleaders at a hockey game was like scratching a blackboard. It had almost nothing to do with the girls or their cheers- it was the concept. After all, there's no cheerleaders in hockey. As complaints from season ticket holders increased, Blair had quickly heard enough. He pulled the plug on the cheerleaders and the booster club was politely, but firmly told that this was a bad idea and it needed to stop. Just a few games after they had first appeared, through no fault of their own the cheerleaders were gone. The season ticket holders and the hockey purists could now go back to the traditional formula for having a hockey game in Saginaw... that is, until a half dozen years later when someone dreamed up the Gear-rilla skating mascot.